← Eat. Pray. Love. Babywear. This is my 42nd installment of Babywearing Stories 365. Each installment features a babywearer in 1 photograph and their answers to 5 questions. My goal is to normalize, promote and celebrate daily Babywearing, moving beyond *what* we use to carry our babies and shifting focus back on *why* and *where* we carry. I hope to share the stories of moms, dads, and babywearing caregivers all over the world. Enjoy! This is a picture of me (Jen) with my 9 month old son, Nate. My husband was the photographer and my 6 year old son is just off camera. We’re in the bubble room of the Boston Children’s museum, during our Spring Break vacation. Vacation explains why there is a picture at all. Like most second-time parents, we don’t remember to photograph moments like we did when our first was born. It’s easier to remember while on vacation than it is while grocery shopping. 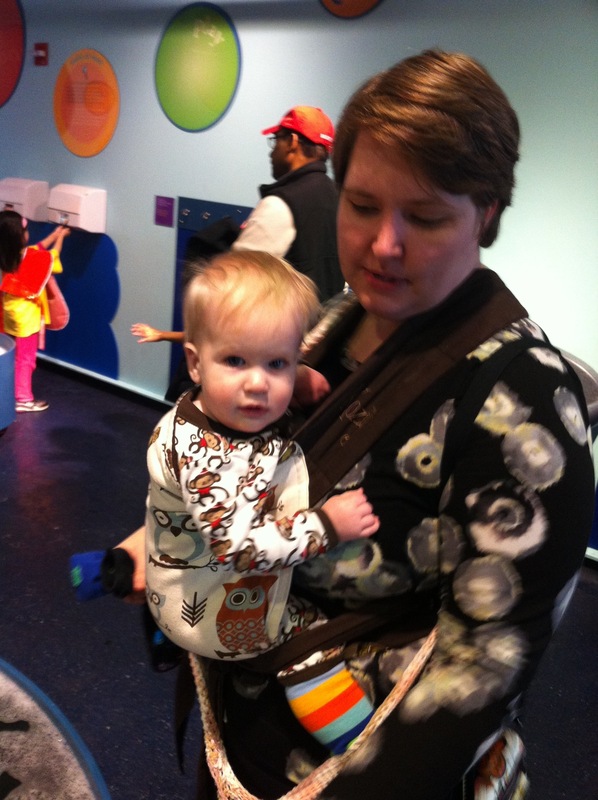 We’re wearing my Kozy Carrier Mei Tai in Owl Trap. Love it! March 25, 2013, early afternoon. The practical: Speed and mobility. Our older son had us to himself for more than 5 years. In that time, he became accustomed to a lot of fun outings. Wearing Nate allows us to preserve a certain amount of our pre-baby lifestyle. We can get around easily and keep up with our older son. On a lucky day, Nate falls asleep in the carrier (as he did on the train back to our hotel on this day) and we don’t have to stop for every nap time. My husband, who usually seems amused by my babywearing, admitted how much harder the vacation would have been if we were wrestling with a stroller. The emotional: I work full time, I don’t get enough time with my children. Wearing allows me to have quality time with both. I also believe wearing gives my baby a greater feeling of security as his world grows. He can move through new environments and interact with new people without leaving his safe zone.